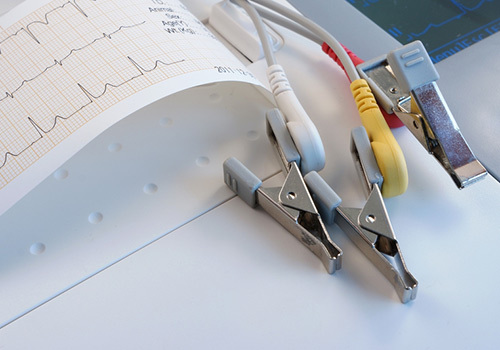 An Electrocardiogram (EKG) Analysis is a safe, simple test that provides your veterinary staff with valuable information regarding your pet’s health. Importantly, the EKG machine merely records electrical impulses from your pet. Please be assured there are no unpleasant sensations to your pet! During an EKG, your pet is typically placed in a standing or lying position. Jelly or liquid (to improve electrical conduction) is applied to the pet and the electrodes, which are attached to the elbows and knees. The small electrical impulses generated by your pet’s heart are then amplified 3,000 or more times and simply recorded to the EKG machine. At times, a more prolonged EKG examination, or Holter Recorder, is required in conjunction with chest x-rays. The Holter Recorder consists of a small pack that is worn by your animal for 24 to 72 hours. This approach is increasingly used to precisely diagnose the underlying reason for the intermittent collapse in pets with abnormal heart rhythm. Again, this process is safe with no unpleasant sensations!